We all know the poem that reminds us of the wives’ batting order at the altar but there is so much more to it than that. The biggest question mark hangs over the ‘survived’ Kateryn Parr. True, she did outlive Henry but only for 18 months. The Dowager Queen married her love Thomas Seymour (brother of Jane and uncle to King Edward) thus making her the boy king’s step aunt-mother. Tea parties to stag nights! Tony is the most versatile Henry VIII performer in the Country. He is a superb mix of actor, historian, lecturer and comedian and performs his one man show at diverse venues. He has been a regular at Hampton Court Palace, Warwick Castle and Stratford Upon Avon; performs at Berkeley Castle and Sudeley Castles in Gloucestershire, has worked at Leeds Castle, Hever Castle, Arundel Castle, Bran Castle, Bratislava Castle and at a variety of stately homes across the UK. He does talks for the Women’s Institute, Probus Groups, active retirement organisations, Universities of the Third Age, masonic lodges, rotary Clubs, civil service clubs, townswomen’s guilds, history societies, luncheon clubs, golf clubs, at private parties, banquets and at hotels up and down the country. There isn’t another Henry VIII interpreter who can successfully entertain a vicar’s tea party in the morning and a rowdy stag night in the evening. 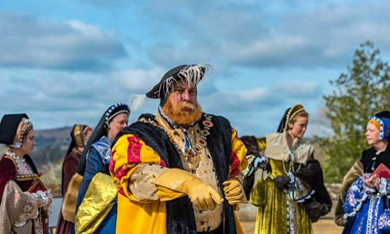 Tony can recommend jousters, fighting knights, jesters, minstrels and falconers who would make your event a complete success; all of whom he has already worked closely with. Tony works exclusively with a group of talented ladies called Past-Times Living History who portray all six of Henry’s wives and a few of his mistresses too! There is even a Cardinal Wolsey and a Thomas Cromwell who will add their own weight to an event. 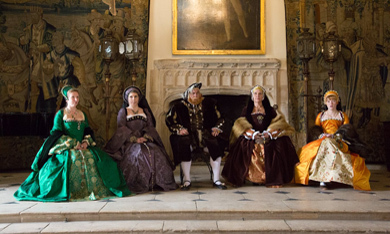 The ladies are not just set dressing; they are performers in their own right in authentic Tudor costume who will add, history, colour and fun to any event of any size. Find them on Facebook and prices on application.